I know my blog has been kind of quiet lately. I ran into some food issues so that's thrown me all off. But I think I'm starting to feel a bit better, so yay! Not that feeling better will necessarily increase the frequency of my blog posting. There are pretty things in the yarn but I haven't taken many pictures to share (though I probably should!) and otherwise there's not too much going on other than knitting, and knitting takes time. There is a slight bit of news today, though. Our air conditioner is broken. Oh dear. The only other excitement here has been knitting related, and honestly I'm not sure how many people will actually find it exciting, but I'm going to share anyway because it is a bit of a triumph for me. In my last post I shared a picture of the yarn I had picked for my next sock project. 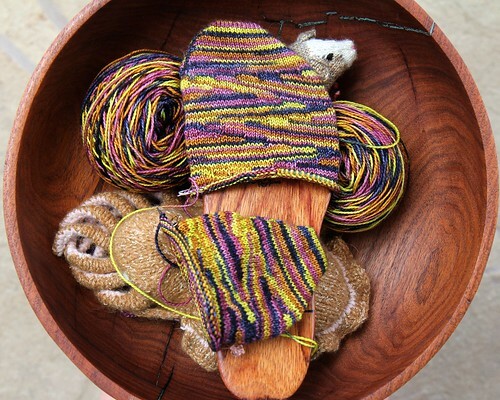 Well, I knew the pattern I wanted to do (Jaywalker) because I had seen someone else make some chevron socks with this yarn and it looked fabulous. However, it didn't work out so well for me. Unfortunate color pooling was the result, not the fun mishmash of random colors. Boo. So I tried another pattern (Hermione's Everyday Socks) and while the blocks of color were smaller, the pooling was still rather unfortunate. Double boo. Then I tried another pattern (Dalekanium) and that one almost worked but not in an exciting way. More of a meh then a boo, but still. Why yes, yes it would! See, he's a knitting genius. While learning something new does make repetition easier, I do think it will be a while before I do this pattern again. I'm pretty sure I will do it again, though - Dan expressed some interest in some of his own and I really can't say no to that. How handy to have a knitting genius by your side! :) Those are going to be great! He is handy! And thank you - I think they're going to be delightfully obnoxious! Oh my goodness, I absolutely adore that yarn. What brand and color is that? I must say, I love most of your yarn choices. I guess we have similar taste. It's Madelinetosh Tosh Sock. Sadly no nylon but so pretty! You gotta knit what inspires you! For me, it seems to be mostly socks (though I am branching out into other things more this year compared to last) even though I barely wear shoes April through September! Hehe!